Mushkin has announced its new family of affordable SSDs primarily aimed at users who would like to upgrade their PCs featuring HDDs. The company’s Source drives use inexpensive 3D TLC NAND memory as well as a proven controller from Silicon Motion, allowing the company to start pricing at $39. 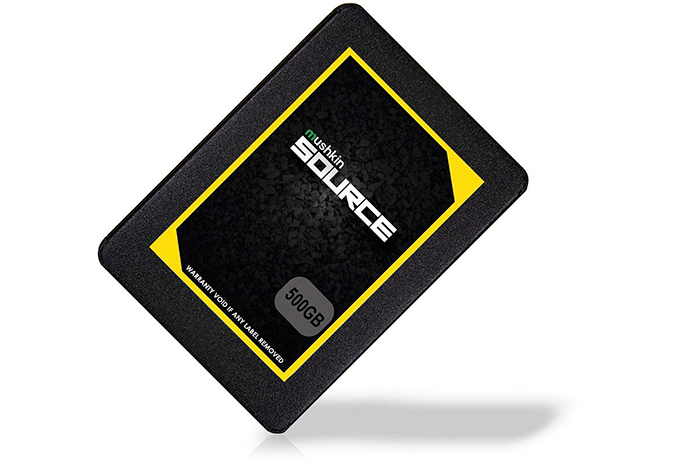 Mushkin’s Source family of SSDs includes three models featuring 120 GB, 250 GB, and 500 GB capacities. Mushkin says that 1 TB model will be included into the lineup at a later date, but does not elaborate. The drives come in a 2.5-inch/7mm form-factor and use a SATA interface, making them straightforward upgrades for existing desktops and mainstream laptops that use DFF storage devices. Muskin also plans to ship a M.2-2280 version of the Source family for ultra-thin notebooks sometimes in April. Mushkin’s Source drives are based on Silicon Motion’s SM2258XT controllers and 3D TLC NAND from an unnamed supplier, a combination that is frequently used by various SSD makers for their entry-level models these days. On paper, the performance of Mushkin’s Source drives is comparable to other inexpensive SATA SSDs: up to 560 MB/s sequential write speed and up to 520 MB/s sequential write speed. As for random speeds, the manufacturer declares up to 75K 4K read IOPS as well as up to 81K write IOPS, which is somewhat lower than what we've seen in other 3D TLC-powered devices. 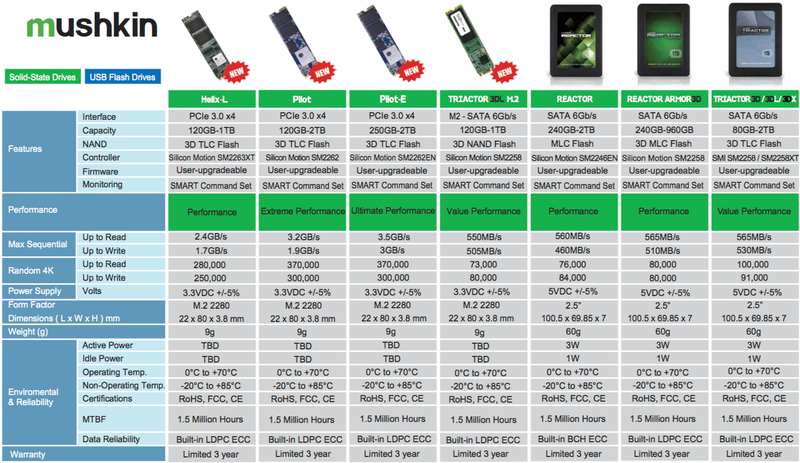 Keep in mind that low-capacity SSDs usually perform slower than their higher-capacity counterparts, so for exact numbers check out the table below. Model Number MKNSSDSR120GB MKNSSDSR250GB MKNSSDSR500GB ? Sequential Read 510 MB/s 560 MB/s ? Sequential Write 440 MB/s 515 MB/s 520 MB/s ? Random Read IOPS Up to 29K IOPS Up to 54K IOPS Up to 75K IOPS ? Random Write IOPS Up to 79K IOPS Up to 81K IOPS Up to 81K IOPS ? MSRP $39 $63 $110 ? The Source family of SSDs from Mushkin is the company’s fourth series of drives based on various types of 3D TLC NAND and Silicon Motion’s SM2258/SM2258XT controllers. Mushkin’s lineup already includes Triactor 3D, 3DL, and 3DX products, featuring capacity points ranging between 80 GB and 2 TB. 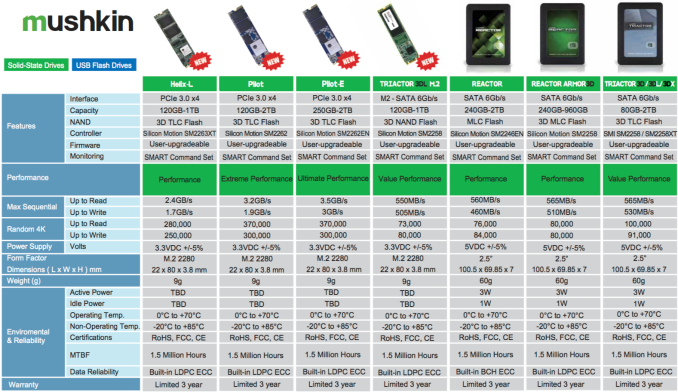 It is noteworthy that based on the numbers from Mushkin’s product catalogue, its Triactor-series drives are faster when compared to the Source drives, but real-world performance of such SSDs isn't likely to be dramatically different. All Mushkin Source SSDs are rated for 1.5 million hours MTBF and come with a three-year limited warranty. The drives are available now in the U.S.: the cheapest 120 GB version is priced at $39, the 250 GB flavor costs $63, whereas the 500 GB SKU is sold for $110. Keeping in mind that formally the Source family of SSDs are Mushkin’s lowest-end drives, expect their pricing to be very flexible. Ok, DRAMless controllers usually have a small cache of SDRAM (around 32MB I think). Was not claiming that the XT-models are using anything other than the internal SRAM though. Meant to say that DRAMless drives have some small amount of internal SRAM (and Phison is the only one I know that mentions the amount of SRAM used which is where I got 32MB from). I would have been shocked to see DRAM on what is seemingly the least expensive SSD on the market, even if DRAM adds only $4 to the BOM.